Did the Wave Election Put Tax Reform on the Agenda? I don’t pretend that tax reform, by itself, will create economic Nirvana. After all, the experts who measure economic policy and economic performance say that only about 20 percent of a nation’s prosperity is determined by fiscal policy. Nonetheless, I’m a big fan of simple and fair tax systems such as the flat tax. Not only because I think we will get more growth, but also because I want to rein in the power of the IRS and reduce corruption in Washington. So did the Republican wave in the mid-term elections make reform more likely? Interestingly, the normally left-leaning Washington Post editorial page seems to have the right attitude about the issue. There is broad agreement that the Internal Revenue Code is an unfair, inefficient mess and that the solution is to lower marginal rates and apply them to a broader base of income. A simpler code, purged of its market-distorting loopholes, would foster economic equality and economic growth, both of which the United States desperately needs. So does the election make reform more likely? Does the rise of a newly elected Republican Senate change that calculus? We’d say that it might… To be sure, Democrats want tax reform to raise money; Republicans want cuts. Still, a good deal of work has already been done on basic principles of a tax overhaul by Democrats and Republicans in both houses of Congress. 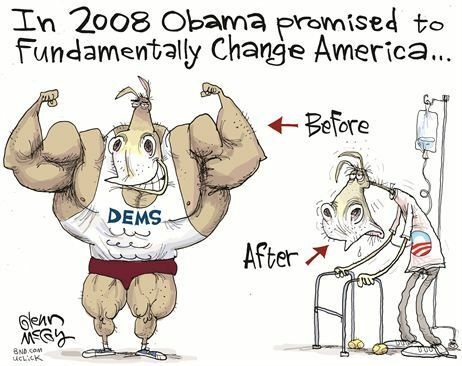 …With a strong push from Mr. Obama, early in the new Congress, they might just be willing to finish the job their predecessors started. I suspect the Washington Post is being far too optimistic about bipartisan compromise. Not only would lawmakers have to overcome the big divide over whether reform should produce more revenue for Washington or less money for Washington, but there’s also a big divide on how to properly measure income. And don’t forget that Obama (unlike the Washington Post) wants higher marginal tax rates because of his class-warfare ideology. But maybe I’m just being a pessimist. Scott Hodge of the Tax Foundation, for instance, also offers a semi-optimistic assessment about the possibility of reform. One of the most obvious questions from Tuesday’s election results is: what does this mean for tax reform? I think it certainly enhances the prospects of Congress and the president reaching a grand bargain on overhauling the tax code… Starting in January 2015, expect the new chairmen of the House Ways and Means Committee and the Senate Finance Committee begin holding a series of hearings on various aspects of reforming the tax system and the numerous “off-the-shelf” options available to them—such as the Flat Tax, X-Tax, FairTax, Cash Flow Tax, and the Camp draft. …Considering the energy to reform the tax code in both the House and Senate, it is quite possible that lawmakers could deliver a comprehensive tax reform bill to President Obama’s desk in 2015. Scott makes several other points, including the long-overdue need to reform the biased revenue-estimating methodology of the Joint Committee on Taxation. However, he also acknowledges that President Obama very likely would veto good tax reform. So even though our economy needs a less-destructive tax code, folks shouldn’t hold their breath expecting it to happen in the next two years. I also addressed the topic as part of a recent forum at the Heritage Foundation, and I outlined several issues that have to be addressed if there is a serious effort to pursue tax reform. Here’s my part of the presentation. 1. The tax base matters. If you don’t fix the double taxation of saving and investment, you may as well not even bother. 2. Bold beats timid. This is why I think a pure flat tax actually is more realistic than a proposal, such as Lee-Rubio, that makes compromises in hopes of being more politically realistic. 3. Highlight international competitiveness. Simply stated, globalization increases the benefits of good policy and increases the costs of bad policy. 4. International bureaucracies hinder good policy. Good tax reform is based on taxing income only once and only taxing income earned inside national borders, yet the OECD wants to impose global rules based on extra-territorial double taxation. 5. Good tax reform is good health reform. The biggest genuine loophole in the tax code is for fringe benefits, and this is a big reason for the third-party-payer crisis in healthcare. 6. Fix the biased scorekeeping of the JCT. The Joint Committee on Taxation uses methodology that it farther to the left than Paul Krugman. 7. Growth trumps fairness. The left will always use class-warfare arguments against good policy and the only effective counter-argument is that economic growth benefits all taxpayers. One final point. Folks often ask me about plans – such as the Fair Tax – that would abolish the income tax and instead collect revenue with a national sales tax. That approach is theoretically sound, but I have some practical concerns based on my distrust of politicians. P.S. Here’s some humorous fallout from the election. Hitler learns that Democrats lost the Senate. Hitler parody videos have appeared many places in recent years. Here are my favorites. The head of the National Socialist Workers Party gets a double-dose – here and here – of bad news about Obamacare. P.P.S. 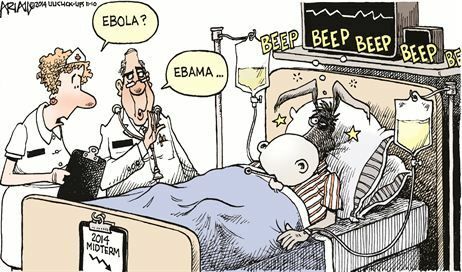 I shared some cartoons before the election with the theme that Obama has been bad news for the Democratic Party. Now that the election is over, that theme is even more appropriate. Here’s Glenn McCoy’s assessment of the change Obama delivered. Robert Ariail has a similar perspective. In other words, as I suggested back in 2012, lots of non-leftist people should be happy that Obama got reelected. No economic nirvana by tax reform alone indeed. But tax attitudes are a proxy, a leading indicator of an electorate’s propensity towards either 5% compounding growth freedom to prosperity, or 1% stagnation coercive collectivism to compounding decline. In that sense, fiscal policy is very important.